under TN Agriculture Extension Subordinate Service. In this latest recruitment of TNAU Asst Agriculture Officer AAO Jobs there are total 206 vacancies are available. Selection for these Asst Agriculture Officer jobs will be through written examination and interview only. Application will be accepted through online via TNAU official website http://aao.tnausms.in/ for this Assistant Agriculture Officer Jobs. Closing date for submission of application form online for this TNAU AAO Jobs Recruitment is 22-05-2017. TNAU Assistant Agriculture Office recruitment 2017 is a very rare opportunity for Agriculture Graduates of Tamil Nadu State. TNAU AAO Exam Guidelines, books for preparation, Exam pattern, Exam Syllabus in Tamil Language (Tamil Book) details, age limits, salary, online application procedure and more information about TNAU AAO Assistant Agriculture Officer Vacacncies Recruitment are given below. Click here to see the official Notification of TNAU AAO Asst Agriculture Officer Jobs. There are total 206 vacancies available in TNAU Tamil Nadu Agriculture University Recrutiment 2017. Categories wise details are given below. For Asst Agriculture Officer jobs of TNAU candidates must have qualified 10+2 Exam and diploma In Agriculture/Horticulture from recognized institutes or universities which are approved by Agriculture Commission of Tamil Nadu State. As on 01-07-2017 for the candidates of SCs, SC(A)s, STs, MBCs/DCs, BCs, BCMs and DWs of all Castes lower age limit is 18 years and there is no limit for upper age limit. For all other category candidates upper age limit is 30 years. Selection for Asst Agriculture Officer Jobs of TNAU will be through Written Test and Oral Test. Written exam paper will be given in both English and Tamil. To apply online for TNPSC Assistant Agriculture Officer Jobs candidate must have register in TNAU portal. You can apply online with old username and id. For new candidates one time profile registration is mandatory. Login with the details of one time profile registration and submit the application form online on or before the closing date of TNAU link website 22-05-2017. Submit application through the website of http://aao.tnausms.in/. Must provide your own mobile number and Email id at the time of online application form submission for TNPSC Asst Agriculture Officer Vacancy Recruitment 2017. After submission of application online send the application copy and relative documents to the Registrar, TNAU, Coimbatore – 641 003 through register post or courier or by hand. 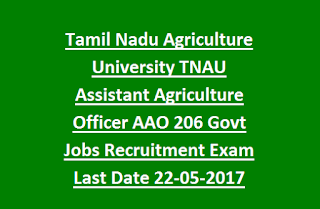 Click here to apply online for the Tamil Nadu Agriculture University Assistant Agriculture Officer AAO Jobs Recruitment 2017. 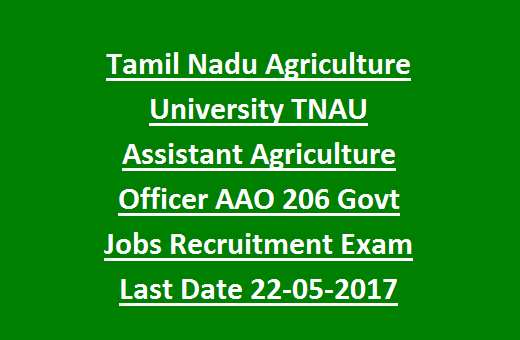 Please share this TAMIL NADU AU Assistant Agriculture Office AO Jobs Recruitment 2017 article to your lovable friends through social networking sites..